We will help in providing answers and solutions for achieving these and much more with the help of “FILTERS”. Filters have now become concepts, which were once integral part of any form of photography. Advanced image editing tools – choice of digital filters increasing day-by-day, have all lead to Filters taking the better known paths of Vinyl and Cassettes in Music industry. Filters to name a few like Polarizer – ND Grads – Warming – Color – which were once considered as key elements in a photographers bag in past for a Nature photographer has now gone digital and has landed up under the tools section in the applications. Irrespective of what one used to shoot like Film, Black and White, Medium/Large formats – usage of Filters were considered to be essential for getting a best frame in past. Over a period of time with Digital sensors replacing Films and RAW capture and Post processing replacing the concept of Dark room – people feel that much can be done in Digital darkroom which filters cant accomplish! The below write-up is not about proving them wrong but to make nature lovers move out of their cozy computer chairs and go out and spend more time in getting best of the image on the field than having spent in front of system fiddling with layers, opacities and masks. Going back to the questions asked in the starting of this write-up – we try to give you an insight into the world of Filters and how each type of filters can enhance and help you capture a better image on the field. When you are out shooting Landscape images – the common problems that every one of us faces is getting good dynamic range, rich colors of the scene, getting rid of the reflections of the rock surface when shooting a falls or seascapes. There are various filters that are available in the market, which will help us solve this entire. PS: Though the technology has advanced so much – not all effects of a filter can be reproduced by image editing software. One clear example being, that of a Polarizer which is, still an elusive task to accomplish in computers. We will detail some of the most commonly used filters in Landscape photography. This one is the most commonly used and apparently one of my favorite pieces of glass that comes along with me for all landscape shoots. 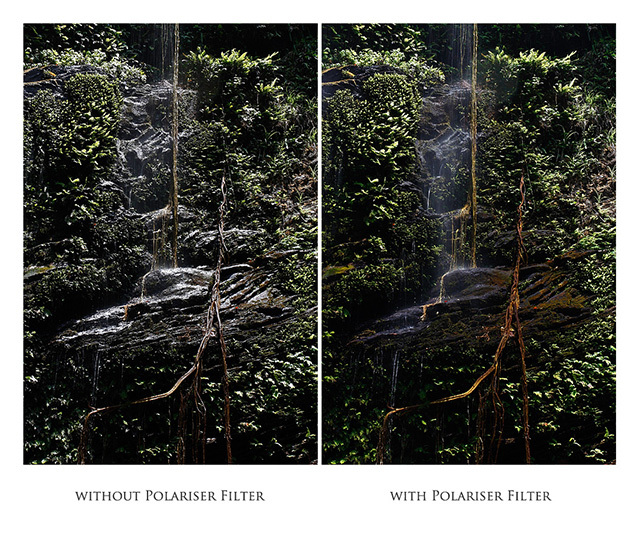 Polarizer is a filter which can be used to cut down on the reflections that come out of water or wet-rock surfaces. When shooting a seascape or a scene involving waterfall with rocks around – a Polarizer will come in very handy in cutting down those glaring highlights of the water. It serves the purpose as 1stop Neutral Density filter when required. One another main advantage of a Polarizer is getting rich and saturated colors of the scene. Polarizer basically gets hooked on to the front element of your lens and it comes in variety of thread sizes depending on the lens used. Rotating the polarizer front element will bring in the effect of cutting down of reflection and increasing the saturation of the image and continuing to rotate will bring it back to the original state. Polarizer come in variety of forms of which one of the main one is the Warming polarizer which gives a warm tone to the image when used appropriately. For those who are not too keen on having this feel to all of their images – can resort to using a normal Polarizer with a Daylight white balance for similar effect. Or sometimes even called, as ND Filters are basically Square or Rectangular pieces of glass, which comes rated in, handy for cutting down the amount of light reaching the sensor of the camera. This helps us with handling high afternoon light or to increase the shutter duration for shooting seascapes and waterfalls. The ND filters comes in variety of ratings like 1-stop, 2-stop, 3-stop etc. These filters can also be stacked together for further reduction in the amount of light capture. Use of ND filters when shooting waterfalls can help you in getting in very lengthy shutter speeds, which will give you a smooth silky, feel to the water movement captured. The answer for this is a direct NO ! – There is always a science side of things what we need to look into when we talk about techniques in photography. A smooth flow of water expects anything lesser than or around 1/5th of a second ( or less or slightly more depending on the situation ) for it to be captured properly for a desired effect. Shooting at high noon with at least possible ISO say 50 clubbed with a small aperture of anything around f22 to f32 will definitely not yield us the appropriate shutter to balance both the exposure and the flow of water. The tendency of the hilight region i.e the water to get overexposed is a common problem. 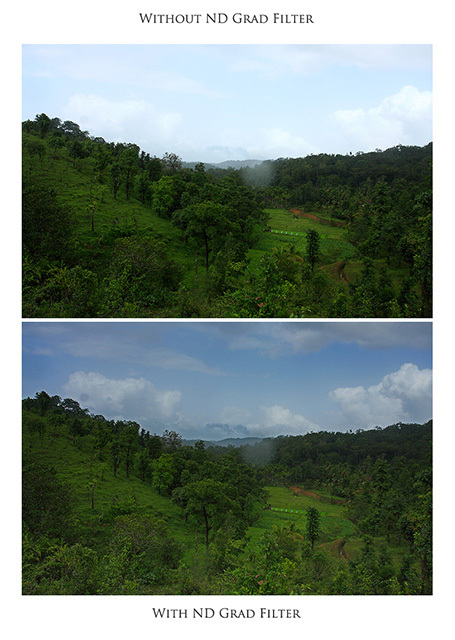 This is one such situation where ND Filter can come in handy to cut the amount of light from the scene. Its adviced that, its better to use “M”anual exposure mode in the camera whilst shooting such scenario which gives better control of the exposure. There is also a circular ND Filter available from SinghRay which is called a Vari-ND filter which can be hooked onto the front element of the lens just like a Polarizer and used to achieve a reduction in amount of light anywhere between 2 to 8 stops of light. Or sometimes even called, as Graduated ND Filter or ND Grad Filters are also rectangular pieces of glass, which is a modified version of the ND Filter. Instead of the entire filter cutting down the amount of light – only one half of the filter cuts down the light. The opacity tapers from top half to about mid level of the filter. ND Grad filters come in very handy when capturing images having both sky and land in the frame. The difference in the light intensity between the sky and the ground tends to reduce the overall contrast in the image and at most times also reduces the details in the highlight or the sky region. ND Grad filter used appropriately can help us reduce the difference in the levels and there by increase the dynamic range of an image. ND Grads also comes in variety of ratings like 1-stop, 2-stop, 3-stop etc. These filters too can also be clubbed together for further reduction in the amount of light captured. – Hard edge ND Grad filters are the ones, which have a clear demarcation between the region cutting the light (the ND half) and clear glass half. These are best suited for Seascapes or where the horizon is a perfect demarcation between land and sky. – Soft edge ND Grad filters are the ones, which have a tapering of filter effect from region of maximum effect to a region of lower effect (usually half way through the filter) with remaining half being the clear glass. These are the most commonly used and find its application in variety of landscape images involving Land and Sky. 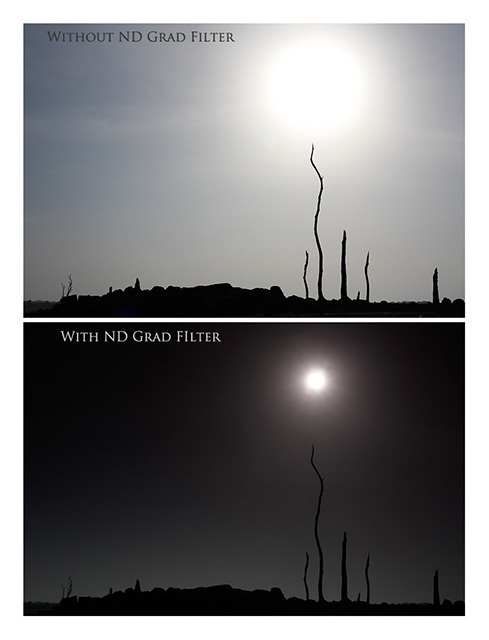 There is further a sub variety in ND Grad filters, which is Reverse ND Grad. 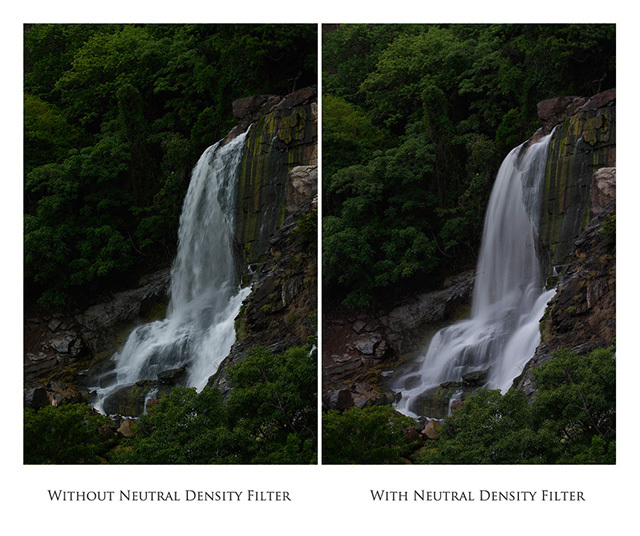 In this the region of higher opacity lies exactly in the middle of the filter and unlike top in the normal ND filters. These too are best suited for Seascape images just before or after sunset when the intensity of light is maximum near the horizon. Having said about the filters there are two ways of using these filters (especially the ND Filter and ND Grad Filters). – Hold them in hand in front of the lens – which will actually give you a flexibility of using the filters for best results. Filters can also be mix and matched for better and creative results and it is known as Sandwiching of filters. This basically involves Clubbing a set of ND grad along with a ND filter which is placed on top of a Polarizer filter. Ideally one needs to screw in the Polarizer into the lens and prefer holding or putting the other two types of filter into holders. In real world scenario filters from manufacturers like Lee, Singh ray, B&W etc are considered to be best in optical quality, which also comes at a higher cost. But that said there are filters from Hoya and Cokin, which are much on a cheaper end – but what you actually get is what you actually pay for. Below is a set of some of manufacturers links, which will give you the complete catalogue of the filters available for a specific use. Found this article very useful. I have been planning on getting some good filters for long time as my current CPL filter is not good enough. I have over time noticed that I end up taking mostly landscape or travel shots and for that I need some good ND as well as CPL filters. Do you know of any place in Bangalore where I could get these filters as well the holder system? I was considering buying a Cokin Z/X pro holder system and some step up/down adapters as well. While i can easily get the filters ordered online from the US, some how the filter holder system is not easy to fetch.